The facelifted Golf Plus that debuted at the Bologna motorshow is available to order at Volkswagen showrooms across the UK. Prices start from £14,410 for the entry-level S model with a 1.4 litre 80bhp petrol engine. Buyers can also opt for a 1.4 litre TSI with 122bhp plus 2 new common rail turbo diesels producing 110 and 140bhp. Two trim levels are offered –S and SE – with first deliveries expected to arrive at the end of April. 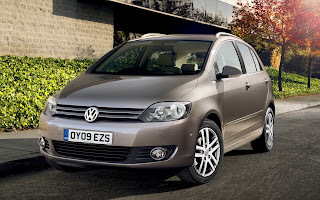 The premium over the equivalent Golf 5 door is between £245 and £1345. Standard equipment on the entry-level S specification includes air conditioning, CD player, multi-function computer, electric front & rear windows, electric adjustable mirrors w/ heat function, ABS, ESP, driver and front passenger's whiplash optimised head restraints and 6 airbags. SE trim adds Park Assist, cruise control, front centre armrest, leather steering wheel and 16" Atlanta alloy wheels.